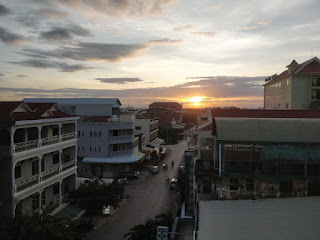 The early Mekong Express bus leaves Siem Reap about 7:30am and it should be a 3 HR journey to Battambang. It actually took nearer 4 because most of the journey the main highway is under construction. Our home for the next few nights was the Royal Hotel, a slightly rough and ready place that was under a tenner a night but still had aircon, balcony and ensuite - just don't expect pristine conditions. Battambang although quite a large town has very little night life or tourist scene, a few bars and restaurants are spread out over a few blocks but it's very quiet compared to Siem Reap. 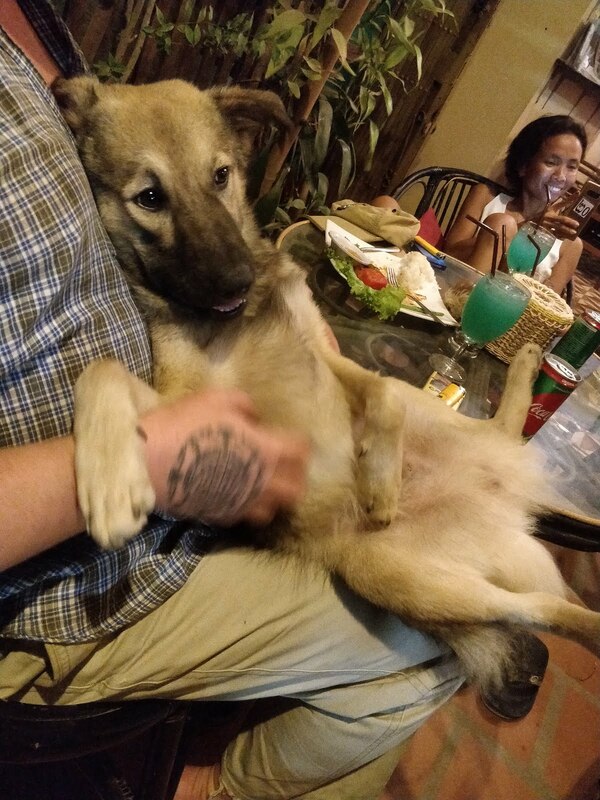 We found a cosy little bar opposite our hotel that had cheap beer, good food, two resident collie dogs, a French owner and was often frequented by other expat/ travellers that would strike up songs on the bar guitar. It was kinda perfect. Dinner that night was at a little place called Coconut LyLy and surprisingly we both went non meat and had a Tofu LokLak and Mushroom Amok. The owner and her gorgeous giggling 5 month old baby boy were a delight and I wish I'd gone back to do a cooking class with her before I left. 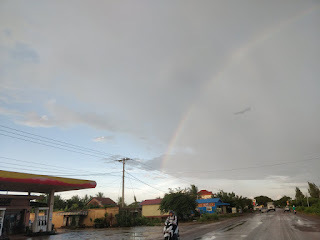 The only reason I'm mentioning it is because it was the best Loklak and Amok we have had so far in Cambodia and that still stands over a week later as I write the blog. In one of the hostels that evening we'd got chatting to a guy that worked there called Sambath, he did full day tours in his tuk tuk for only $9 each taking you round the sights and local traditional food. He already had two other girls signed up for the morning, so we agreed to go as well and arranged pick up the next day at 9:30am. The following day we woke to a beautiful clear blue sky and it was hot by 8:30, but we slathered ourselves in sunscreen and set off with 3 others in Sambaths tuk tuk. We were joining Esther, Rachael and Jordi for the day and we quickly got chatting and swapping travelling stories and tips for other destinations as they had already done bits of Cambodia. First stop was at the sticky rice road side stall. Here Sambath showed us how they fill the bamboo tubes with rice, seal the end with banana leaves then half cook, half steam them over hot coals. The rice will keep for 3 days once cooked and is really tasty. We even bought an extra one for later snacking. The next stop I can't say was overly pleasant but it was interesting, it was the fish paste factory. This is where the fish paste for all the local dishes is made, although Sambath is quick to say that most of the western restaurants don't use this. I'm pretty sure they do but once you've watched the fermented fish be thrown on the concrete ground to be sorted, it's probably best not to think about it when eating your dinner. There is obviously a great deal of work and process that goes into making this end product and it's nice to know that none of the fish is wasted, but I was glad when we moved on. 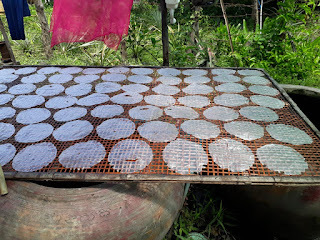 We then stopped at a place where they make the rice paper sheets for spring rolls. 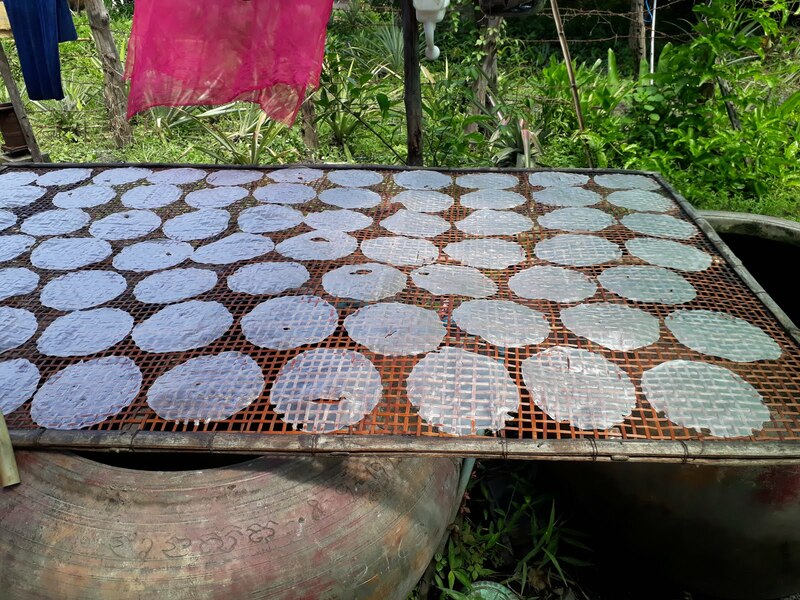 There we watched two girls produce a seemingly endless supply of little round rice paper to dry on huge racks in the sun. Of course they sell freshly made spring rolls, which we had to try and were very tasty. Onward to some more locally produced food - dried banana sheets. This is just thinly sliced small bananas laid out in sheets and dried for a day in the full sun. I don't normally like banana but even I enjoyed this sweet caramelized snack and watching the woman cut the thin slices so quickly was amazing. The next thing to see made was these wafer type things. They are pretty much the type of wafer we'd expect with ice-cream in a fancy restaurant, but here they make and sell bags of them at the roadside. We also got banana crisps which again I liked. Feeling full of snacks and nibbles Sambath had just one more thing for us to try before we went to a temple...rat! Apologises to the vegetarians/ vegans! It's fried whole in a huge wok again at the roadside and as Esther was a veggie Sambath bought us one that the rest of us could all share. It was actually very nice, a bit like a roasted pheasant but maybe not the nicest thing to watch people gnaw on. The next stop was Ek Phnom, which is an 11c Hindu temple that is mostly collapsed. Today they have a modern Buddhist pagoda built next to the site with a huge white stone sitting buddha and it’s a popular place for everyone to visit. 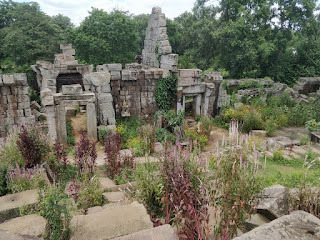 The actual old temple, although probably slightly dangerous to clamber about is very beautiful as the space in-between the fallen walls is now home to gorgeous wild flowers. After a brief wander round we headed to the Bamboo train. 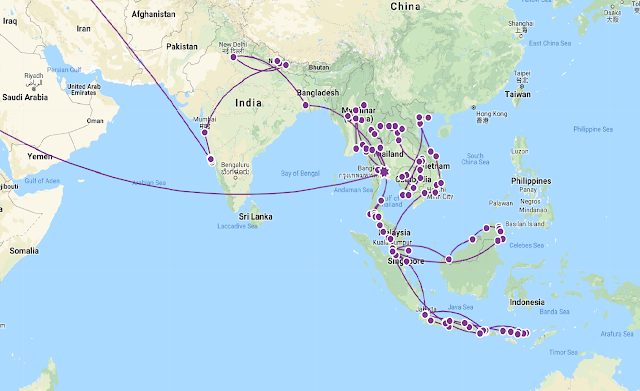 This was something that we’d wanted to do since before we’d left the UK but as we’d heard that the old one was closed and a new fancy tourist one had been built, we were a bit sceptical of what we might find. Turns out that the old line is still there it’s just gradually being renovated so they can use it as a main train line in the future. In the meantime, the locals have continued to use a stretch of it for paying tourists and it was here that Sambath took us. As it’s only a single track the most amusing thing about the bamboo train is when you meet another platform going the other way, the one with the most passengers gets to stay on the track and the losers must dismantle the platform and move it to the side of the tracks to make way. As we were a train of 5 passengers we pretty much bullied our way up and down the track. I can’t remember the exact order of what we did in the afternoon, but it seemed like every few mins Sambath would stop to show us a beautiful Pagoda, or feed the huge catfish in a lake, or show us fruit bats hanging in a tree. It was a fantastic day that we crammed so much in. 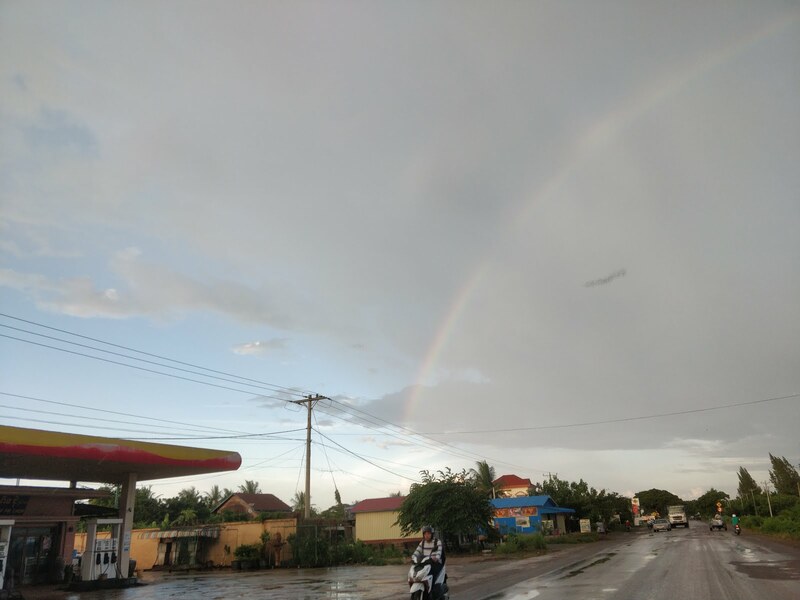 The end of the trip was organised so that we could see the bats emerge from their cave but I almost thought we were not going to see it as just before we got there, the heavens opened and we got the most torrential rain shower. It lasted about 45mins but stopped just in time for everyone to gather on the muddy streets to watch the bats. You can’t get as close to this bat cave as we did in Myanmar but you can see the groups of bats snaking off into the distance for ages and as we had a rainbow in the sky as well as the setting sun it was quite special. We didn’t stay watching the bats for too long as the setting sun was promising to be gorgeous so Sambath took us to a viewpoint by some rice paddies. This involved going off road on a thick muddy track and it wasn’t long before we had to get out as the motorbike wheels were just spinning. 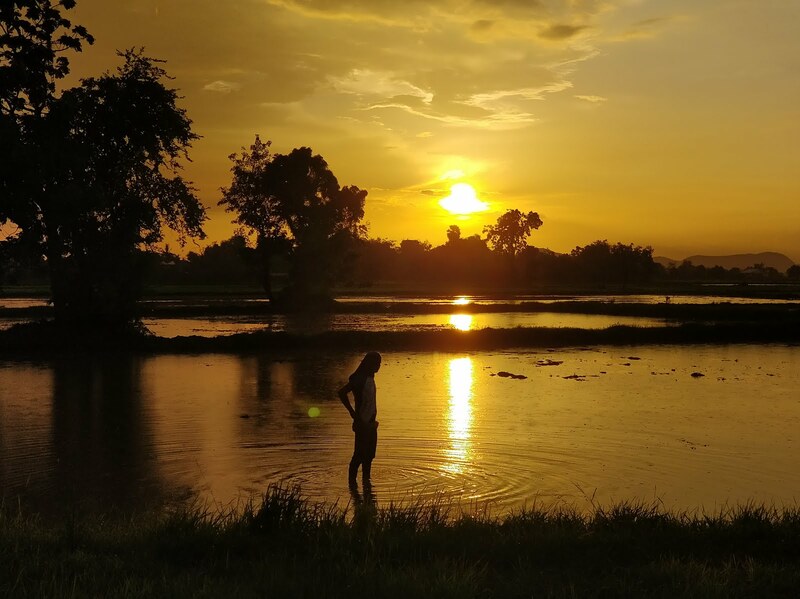 With the sun turning orange in the distance you forgot how muddy your shoes were and Sambath went off to paddle in the field for that perfect sunset shot. As the light was fading and it looked like the tuk tuk might be needing some extra encouragement from us to get out of the field we headed for the main road. Safely back on solid ground a little bit dirty we headed back for town, but the sky behind us kept on providing one of the most beautiful sunsets I’ve seen on my travels and we ended up stopping for more pictures. The following day we stayed around town doing odds and sods on the laptop, going for coffee, eating, drinking beers and generally being quite lazy. Our next stop was the capital Phnom Penh and the sombre experience of the Genocide prison and Killing fields, which I was and wasn't looking forward to.